The gigantic front row says Joe Schmidt’s men are the ‘front runners’ to win the championship. Atonio made an impact for France off the bench. FRANCE’S ENORMOUS TIGHTHEAD prop Uini Atonio says Joe Schmidt’s Ireland are in pole position to win the Grand Slam this year. Speaking after France’s 18-11 defeat in Dublin yesterday, the New Zealand-born front row stated his belief that Ireland are a “world-class team” and admitted les Bleus weren’t good enough to win. Ireland’s victory means they stand second in the Six Nations table, behind England only on points difference. Schmidt and his players now begin preparations for hosting Stuart Lancaster’s side in Dublin on 1 March, before trips to Wales and Scotland later next month. Atonio can see Ireland winning all three of their remaining fixtures. “They won the tournament last year, so they are capable of doing that again,” said the La Rochelle captain, “and they are in pole position to do the Grand Slam I think. To be honest I’m not looking down on them but I hope they could lose one game, because that would still give us a chance of winning the tournament. It’s such a tough competition, so if you’re not on your game you’re going to lose. 146kg Atonio enjoyed a 30-minute cameo off the bench, making five powerful carries. Indeed, each of Philippe Saint-André’s replacements made a notable difference to the momentum of the game as France finished on the attack. “I think we did that, and Romain [Taofifenua] scored a good try as well,” said Atonio. Next up for France is a home fixture against Wales on 28 February, and Atonio is hoping Saint-André’s men can take a leaf out of Ireland’s book. “We saw the way they’ve played, they’ve moved up the IRB rankings and they are a world-class team. So if you want to beat a world-class team at their home ground then you have to put in a world-class performance. Email “'Ireland are in pole position to do the Grand Slam' - France prop Uini Atonio”. 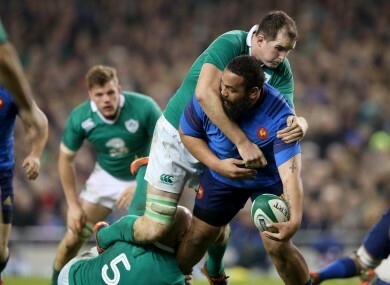 Feedback on “'Ireland are in pole position to do the Grand Slam' - France prop Uini Atonio”.